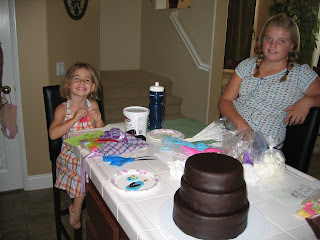 Here a few pictures of our cake-making process yesterday. 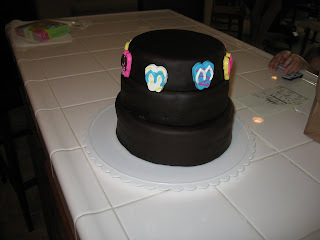 I decided to make a 3 tiered, chocolate fondant cake. 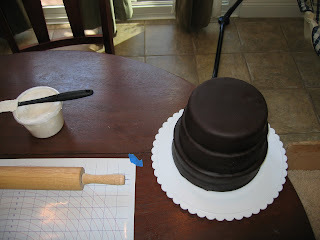 Under the fondant is either chocolate or white buttercream frosting. Not too decadent. So, to cut the sweetness, I added solid chocolate flip flops to a couple of the layers. We'll also have ice cream for those folks who need something cold with their cake. A friend from across the street, Brodie who's 11, came over to help me make the colorful chocolate flip flops that will decorate the cake. She was a true help! Her mom, Gaynor, also helped me with Mason. She is always a willing babysitter when I need one. 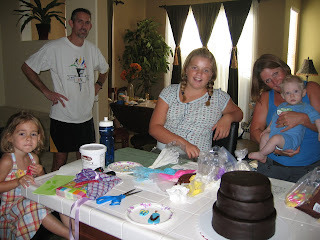 I'm still making some decisions about the rest of the decor for the cake, but it'll get done...it has to. Okay, to reduce sweetness you made flipflops out of solid CHOCOLATE?! Hello, I want to reduce my sweetness intake at your house.